Book hotel rooms online with us at Vila Gale Albacora Hotel at the lowest rate, guaranteed. 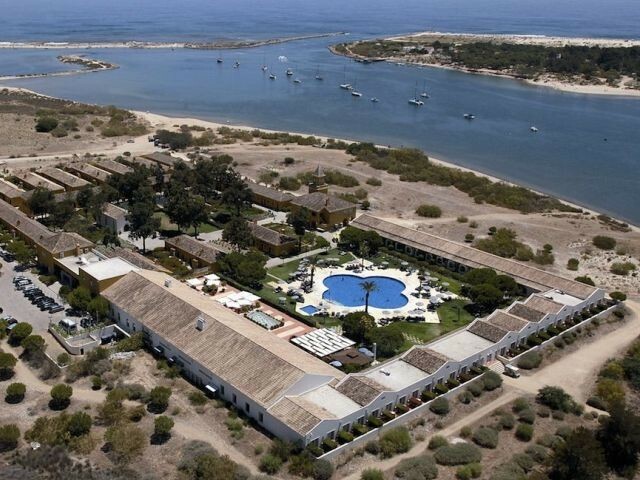 Get your holiday discount room rate at the 4 Star Vila Gale Albacora Hotel located outside the town of Tavira in the eastern Algarve. The hotel has been constructed on the site of an old tuna fish factory perched on the inland shore of an inlet from the ocean. Within the grounds are the 162 air-conditioned guest suites each providing holiday accommodation for two adults and also for persons with physical disability. They are all well decorated with modern comfortable furnishings. The Vila Gale Albacora Hotel suites have terraces and are equipped with satellite TV, direct phone, radio, Wi-Fi and a mini-bar. Vila Gale Albacora Hotel facilities include its Spa with massages and treatments, an indoor pool, sauna and steam baths, two restaurants, a bar, a large outdoor pool, Wi-Fi, a Fitness Centre, a Kids Club in season with playground and a games room. To add to the interest of visitors there is an interesting tuna fishing museum within the grounds, also, a chapel from when it was a tuna factory. The nearest beach is reached by a regular quick daily ferry trip.